It’s Tuesday afternoon. 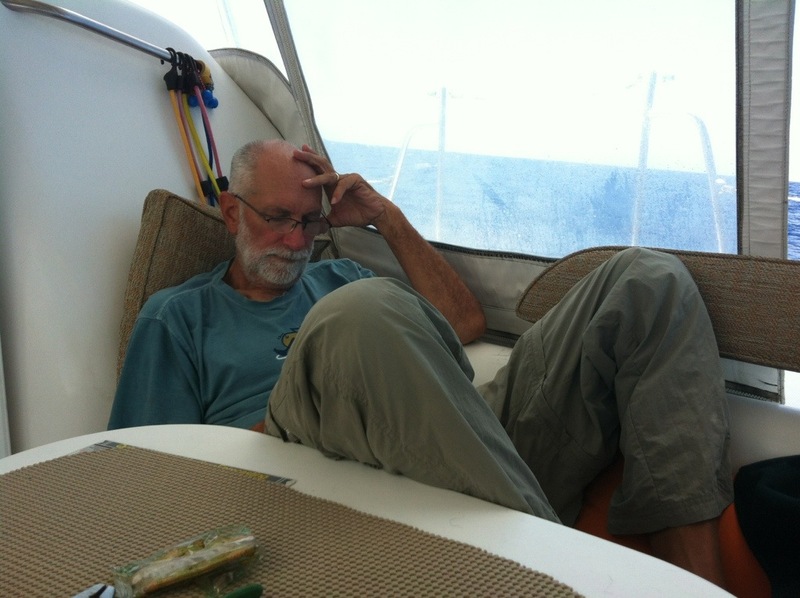 We’ve been at sea for 11 days and we’re still 160 miles from the islands. After a perfect night of east wind and the same for most of the morning we’re suddenly experiencing wind shifts that take away our speed and our direct course. We have to constantly adjust the sails to keep moving against the wind and seas that are now on our nose, now on our port bow, then back on the nose again. 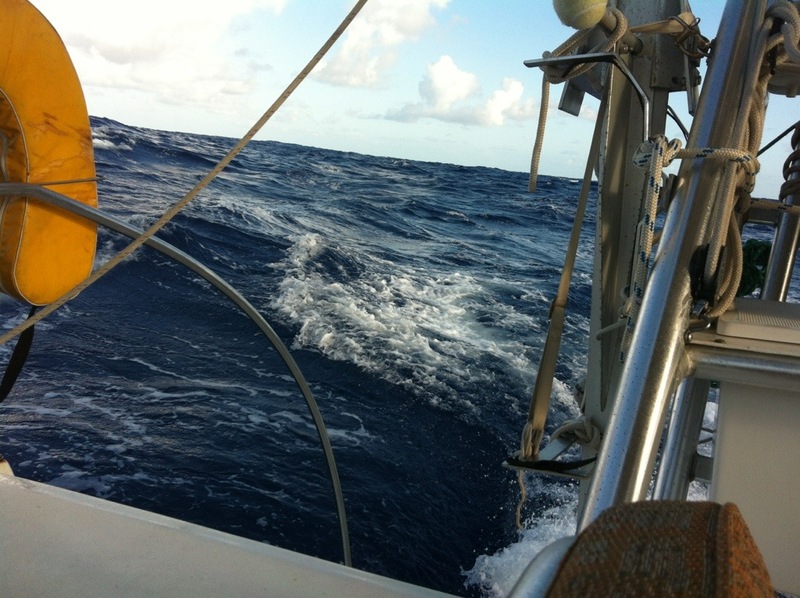 For a while we ran one engine trying to keep the speed up but slamming bow first into these waves is tiring. Eventually we shut it down and accepted the fact that we will not make port on Wednesday as we hoped. But that’s ok. Once we stopped futzing with the boat we’re enjoying another beautiful day at sea in good, but chilly, weather, doing our usual afternoon samba of following the shade around the cockpit and dozing on and off. It’s not even Talk Like a Pirate Day and arrgh is all I can say. Last night we had a rollicking broad reach of a sail that made doing Monday Beans night like an evening in the fun house. It was my turn to cook. This is not an elaborate affair, especially on a passage with eight foot seas. Open a can of Bush’s vegetarian baked beans and dump them into a pot while bouncing around Escape Velocity’s galley like an astronaut showing off in the space station. If you got any in the pot you’re halfway home. Next wedge the pot on the stove with other pots and lids because it’s not staying there otherwise. Maybe it’s best to just hold it there. Now if you thought ahead one of the pots used to wedge in the bean pot would be the frying pan so you can cook the frozen hot dogs. Throw them in and clamp down the lid because, in a labor saving miracle, EV will roll them back and forth until they are beautifully evenly cooked to perfection! This next bit gets tricky. Get two passage bowls with non-slip rubber on the bottom — here on EV we call them dog bowls — and unwedge the bean pot, and here is where Marce and I bifurcate on technique, she spoons the beans into the bowls suffering a death by a thousand cuts where I just go for it and plop it in there. Assuming you got some in the bowls we set up a bucket brigade to get the stuff out to the patio dining table because there’s no way you’re going to eat inside. Of course it takes about five minutes for the quease factor to settle down. 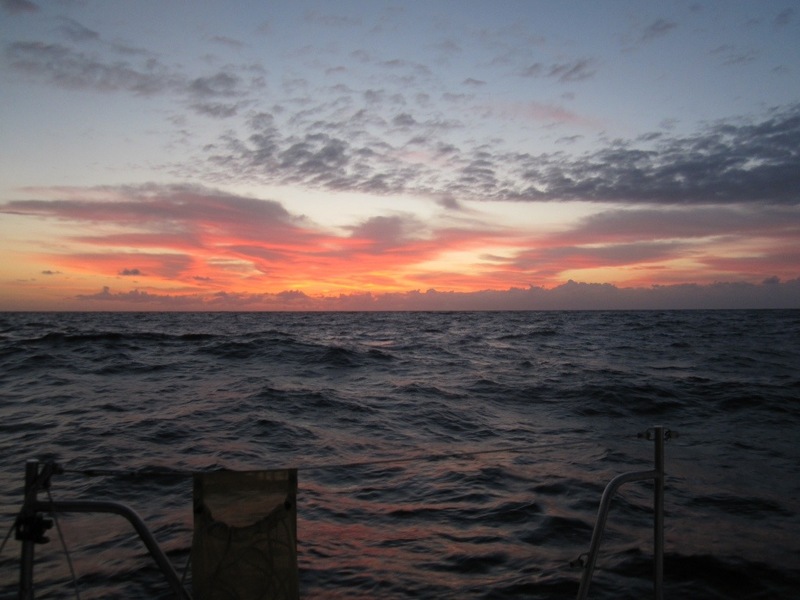 This morning the wind clocked around to the south which forced us a little west of south which means bashing into big seas and running one motor just to keep our speed up. Still working on that patience thing. Escape Velocity doesn’t have a proper sea berth, although in most circumstances as a catamaran we don’t need one because we stay pretty upright and don’t heel over with the wind like monohulls do. But the past few days muscling windward in 7-9 foot seas I sure wish we did. It gets too much like a carnival ride down below. A sea berth is a narrow bed amidships where the motion is less violent, usually a settee. So that you don’t fall out when the boat leans the other way the berth is fitted with either a lee board, a stowable rail like you’d use on a hospital or child’s bed, or a lee cloth, a canvas or net contraption rigged to keep you from falling out. 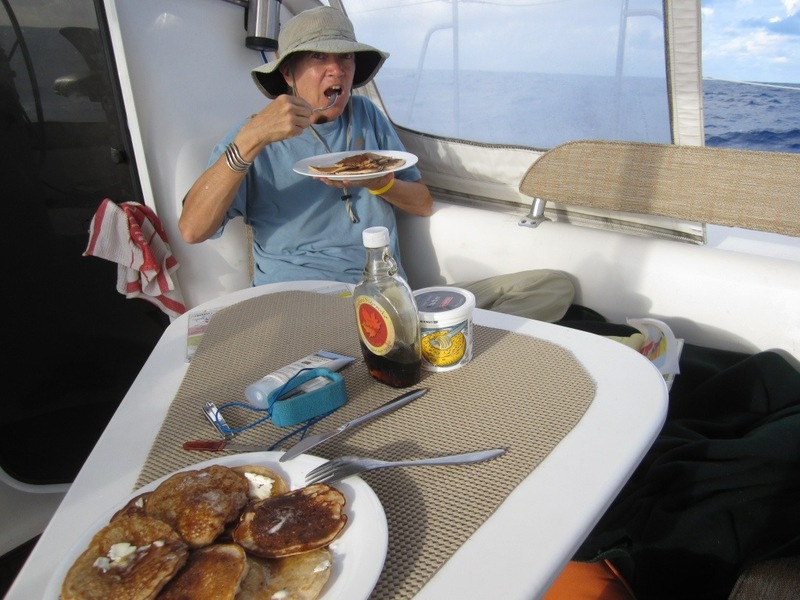 I like lee boards because its easier to get in and out of the berth but I saw one break once as a result of a particularly heinous wave in the Gulfstream, dropping the berth’s occupant — Jack — against the saloon table and engine box narrowly missing serious head injury. In any case, the idea of a sea berth is to hold you snugly at shoulder width so you can sleep no matter what wild corkscrewy motion the boat might do. I know, sounds claustrophobic, right? I was afraid of that too before our first sea passage. It was on Victoria, our friend Stan’s lovely and sturdy 34-foot Tartan. We were on our way from Annapolis to Martha’s Vineyard, a trip that would take several days. When it was time for me to go off watch and sleep I dreaded crawling into that skinny little berth, especially since I like to flotz aound a fair bit while I sleep and there’s no chance of that here. But once I hiked myself over the leeboard and got settled It was surprisingly comfortable. I put on my headphones and pressed play on the old Sony portable CD player and the Flecktones took me away. A minute or two later someone shook my shoulder. “Five minutes,” I heard through Flight of the Cosmic Hippo. I looked at the clock. Four hours had gone by. I was out cold and UFO Tofu had played over and over again while I slept. We don’t get that on EV. We don’t sleep in our own bed on passages because the autopilot is below our berth and it makes a high-pitched whoopwhoopwhoopwhoopwhoop! sound that reminds me of Curly from the Three Stooges. Plus, in a queen size bed there’s nothing to keep you from rolling back and forth with the boat’s movements. We have a settee in the main saloon and that’s generally where I spend my off-watch nap time but since this passage is so incredibly bouncy and rolly I have to spend a lot of physical and mental energy just staying put because there’s nothing to keep me from going airborne or whacking some delicate body part against the edge of the saloon table. I’ve developed all kinds of cricks and stiffness from being clenched for hours. Then there’s the noise. Right overhead are plenty of mechanical bits that clank and squeak and groan, and below is the banging and crashing of waves against the bridgedeck. Sometimes a wave hits us so hard that everything in every galley cupboard and drawer goes airborne for a second then lands with a huge crash so loud you’re sure everything’s broken. (It isn’t.) Even the oven shelf clatters with the waves. It’s hard to hold a conversation, let alone sleep. Tonight, after a very bouncy day when I was feeling a little queasy Jack offered to take the first watch and I accepted, figuring I could sleep off the stupor induced by the non-drowsy formula Dramamine. Ha! I stuck the earbuds in and tried to drown out the sound long enough to get to sleep. I went through Gomez, Mumford, the Punch Brothers; even Adele at top volume couldn’t knock me out. I dozed a little and finally gave up and went outside to relieve Jack early. “I was going to let you sleep another hour,” he said. I told him I couldn’t sleep and curled up under the blanket in the corner of the cockpit, our coziest spot. “But I’ll nap here for an hour if that’s ok,” and within a minute I was asleep. The cockpit sounds are familiar and comforting, and the space is small enough to feel secure. An hour later Jack nudged me right in the middle of one of the vivid dreams we’ve both been experiencing off-watch. In this one I’m having breakfast with my family in New Jersey. And with that he went below to the Presidential Suite and I shook myself awake and started my five-hour watch. I can almost taste that flagel.